Overview - Chasing Mavericks is the inspirational true story of real life surfing phenom Jay Moriarity (played by newcomer Jonny Weston). When 15 year old Jay discovers that the mythic Mavericks surf break, one of the biggest waves on Earth, is not only real, but exists just miles from his Santa Cruz home, he enlists the help of local legend Frosty Hesson (played by Gerard Butler) to train him to survive it. As Jay and Frosty embark on their quest to accomplish the impossible, they form a unique friendship that transforms both their lives, and their quest to tame Mavericks becomes about far more than surfing. Chasing Mavericks was made with the help of some of the biggest names in the surfing world, and features some of the most mind-blowing real wave footage ever captured on film. Is there a better visual symbol for overcoming life's many insurmountable obstacles, than a surfer successfully riding a really huge wave? Well, if there is, please don't tell the producers of 'Chasing Mavericks,' because they seem really keen on the idea. A heartwarming, inspirational flick based on true events, the movie offers a well-intentioned but dramatically clunky experience that languidly milks its life-affirming metaphor for all it's worth. It may not be a new sports film classic, but thankfully, it's also far from a total wipeout (wow, I wonder how many other critics have used that same line). Jay Moriarity (Jonny Weston) is a polite, easygoing teenager who loves to surf. Determined to tackle the fabled Mavericks surf break -- which is home to some unusually large and dangerous waves that are being further intensified by the dreaded "El Nino" -- Jay seeks guidance from his neighbor, Frosty Hesson (Gerard Butler). A seasoned surf legend in his own right, Frosty decides to take the talented boy under his wing, giving him the training necessary to survive the Mavericks' perilous challenges. As Jay struggles to live up to Frosty's lofty expectations, he also has to deal with his neglectful mother (Elisabeth Shue) and his burgeoning romantic life. Faced with a series of seemingly overwhelming physical and emotional barriers, will Jay have what it takes to conquer the waves? For the most part, the movie sticks to general tried-and-true inspirational story beats, and in many ways the film becomes the surfing equivalent of 'The Karate Kid' -- complete with unconventional training methods, clichéd bully antagonists, and Elisabeth Shue! Through Frosty's sage tutelage, Jay's journey becomes more than just about surfing, and the principles that Frosty tries to instill in him take on larger concepts dealing with determination, hard work, and overcoming fears. The central father/son dynamic that develops between the two is well executed, and both actors ultimately share endearing chemistry, leading to a schmaltzy but admittedly affecting finale. While Gerard Butler is no Mr. Miyagi, he does a solid job as the legendary surfing guru turned mentor, who still remains tormented by his own losses (even if he does overplay the role a bit). Relative newcomer Jonny Weston is also fittingly likeable as the relaxed and friendly Jay. He serves as an effective protagonist, and though his straight-laced, "aw-shucks" routine can be a little much, the young actor does a nice job of revealing the character's deeper anxieties and overarching positive outlook on life. Ultimately, the entire runtime rests on his shoulders, and Weston manages to keep the emotional core of the proceedings afloat, even when some pesky storytelling stumbles threaten to otherwise drown the film. Much like Jay, the film itself runs into some lofty challenges, and unfortunately a few obstacles end up getting the better of the script. Though based on true events, the overall narrative is pretty thin, and many of the plot points are quite familiar. Some of the drama also feels forced and unmotivated. This is especially true of a scene that involves Frosty's overly aggressive reaction to an essay Jay writes. Actually, in general, Frosty seems prone to unnecessary anger and frustration for mostly silly reasons (and this is more of a performance and scripting issue than a genuine character quirk). When real tragedy does strike, the movie attempts to create a dramatic reversal of sorts, momentarily setting Jay up as Frosty's savior. Though fine from a conception standpoint, this subplot is underdeveloped and very rushed, leading to an emotional resolution that feels way too easy. Likewise, Jay's story with his mom is also skimmed over, and after being nearly comatose for the majority of the runtime, she randomly wakes up on his birthday to suddenly become mother of the year. Really, all of the film's arcs feature similarly thin and flat executions, and the script's coda also presents a few additional issues. Mirroring the true story that it's based on, the movie ends on a rather tragic note, and while I'm glad that the filmmakers didn't try to sugarcoat or ignore what really happened, the last few sequences feel tacked on, and the sad turn of events serve to muddle some of the film's message. Thankfully, these shortcomings in scripting are counterbalanced by heartfelt sincerity and some truly incredible surfing cinematography. From a purely visual standpoint, once the movie takes to the ocean, the film really hits its stride. The surfing sequences feature a variety of angles that mix intimate, close-up views with sweeping aerial shots. Just about every perspective and vantage point is accounted for, creating a visceral and lively experience that really gives the massive waves a palpable sense of scale. The climax is especially impressive, and the sheer number of boats and surfers the production was able to wrangle in shot at once is incredible. Special note must also go to the face replacement technology used to paste the actors' likenesses onto the stunt surfers. I can usually spot this kind of CG trickery immediately, but here it really is seamless, and only after seeing the shots pointed out in the special features did I actually notice the effect. Though it's unlikely one would guess so based on its harmless and unassuming stature, 'Chasing Mavericks' actually has a surprisingly troubled production history. The producers spent five years trying to get the project off the ground, and then once shooting began, the film's future was threatened by the exit of its original director, Curtis Hanson ('Wonder Boys' and 'L.A. Confidential'), due to health concerns. Despite this behind-the-scenes drama, the resulting movie remains stylistically cohesive and ultimately enjoyable in the hands of Michael Apted, who completed the shooting of the film. There are some notable problems, but the story's heart is always in the right place, and the surfing footage is fantastic, bringing an extra level of visual spectacle to the screen. While the dramatic beats are all predictable, this is a well-meaning family effort that manages to (mostly) convey a positive message while offering some decent entertainment value. 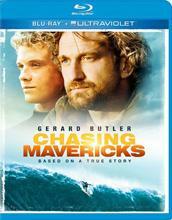 20th Century Fox presents 'Chasing Mavericks' in a Blu-ray/UltraViolet Combo pack. A single BD-50 disc comes housed in a keepcase along with instructions for an UltraViolet digital copy. Some skippable trailers play upon startup before transitioning to a standard menu. The packaging indicates that the release is region A compatible. The movie is provided with a 1080p/AVC MPEG-4 transfer in the 1.85:1 aspect ratio. Home to some truly impressive surfing footage, this is a strong video presentation that is only held back slightly by a few inconsistencies. The digital source is mostly clean, but there are some fleeting signs of aliasing and minor noise. At its best, the image is home to razor sharp clarity and a lifelike sense of dimension that really shows off the incredible surfing stunts. The deep blue ocean sparkles off the screen, and one can make out every tiny drop of water splashing through the air as the characters cut through each massive wave. Colors are often very rich, offering vivid hues that pop (particularly in the opening scenes). With that said, the palette can appear a bit drab in a few sequences, and the frequently overcast skies result in an occasionally dull appearance. Likewise, contrast is frequently blown out, leading to a loss of depth in some shots. Black levels are inky, but shadow detail is a little crushed in the darkest scenes. While the visuals become a tad uneven when the story shifts to the land, the surfing footage is truly mesmerizing, capturing all of the crew's painstaking work beautifully. The movie is presented with an English DTS-HD Master Audio 7.1 track. Additional Spanish and French Dolby Digital 5.1 tracks are also included, along with optional English SDH and Spanish subtitles. Much like the video, the mix proves to be quite impressive during the surfing scenes, but loses steam when off the water. Speech is clear and balanced well throughout. During the surfing segments, the soundstage completely comes alive, surrounding the listener in an immersive and nicely textured environment. The rustling water moves naturally throughout the room, and the crashing waves create a convincing low frequency rumble that puts the audience right in the characters' shoes. Little touches -- like the manner in which the breaking waves initially hit the front speakers, before the sound of their cascading drops organically transition to the rears -- all add an extra level of authenticity to the atmosphere. Outside of the surfing sequences, the track is less engaging but still remains solid, offering appropriate directionality, general ambiance, and musical separation. Dynamic range is wide and distortion free, and as mentioned earlier, bass activity is clean and expansive. Totally enveloping when it needs to be, this is a strong audio track that fully brings the Maverick's crashing waves to life. 20th Century Fox has put together a nice selection of supplements, including a commentary, deleted scenes, and several featurettes. All of the extras are presented in 1080p with Dolby Digital 2.0 sound and French and Spanish subtitle options. Audio Commentary - Co-director Michael Apted, and producers Brandon Hooper & Jim Meenaghan offer a very informative track that illuminates the difficult five year journey it took to get the film made. The trio share details on every aspect of the production, elaborating on casting, scripting, locations, stunts, and effects work. Apted also addresses how he came on board to replace the movie's original director, Curtis Hanson, who had to bow out due to health concerns. Deleted Scenes (HD, 6 min) - Five deleted scenes are viewable separately or together. There are some worthwhile extra bits between Jay and Frosty, and Jay and Kim, but overall these were wise cuts seemingly made for pacing concerns. Surf City (HD, 11 min) - In this featurette, the cast, crew, and professional surfers all discuss the ins and outs of Santa Cruz, California. The participants elaborate on the community's surfer culture, and how important it was for the production to shoot on location. Shooting Waves (HD, 11 min) - Here the focus shifts to how the filmmakers captured all the incredible surfing cinematography. We get a look at some behind-the-scenes footage that shows off the elaborate camera rigs used to cover all the diverse angles seen in the film. The computer VFX are also addressed, and the painstaking face replacement process is detailed and demonstrated, revealing how the team seamlessly pasted the actors faces onto the stunt performers. Live Like Jay (HD, 11 min) - Here, friends and family reminisce about the real Jay Moriarity and elaborate on his positive outlook on life. Surfer Zen (HD, 10 min) - In the last featurette, the cast and surfer consultants discuss the spiritual and artistic mysteries of surfing. A scary wipeout during the shoot involving actor Gerard Butler is also addressed, and it's revealed that the star actually came pretty close to drowning. 'Chasing Mavericks' brings a visceral surfing twist to the tried-and-true 'Karate Kid' formula. Its plot is thin, predictable, and a little flat, but Jay Moriarity's story is definitely worthwhile, and the filmmakers offer a reasonably entertaining experience. The video and audio are a little inconsistent, but both manage to impress greatly during the numerous surfing sequences. The special features provide some interesting trivia about the shoot and the real life inspirations behind the story. While this is far from a must own title, it's still an enjoyable family film that should make a solid rental.